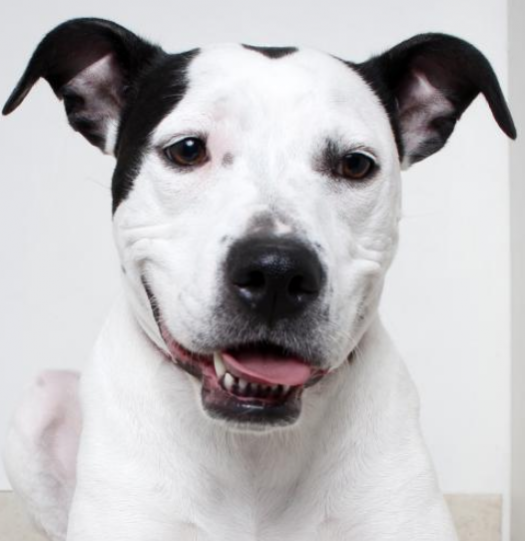 Shasta is a beautiful three year old American pitbull terrier mix that was born in rescue to Momma Pixie. She is dog and kid friendly and is okay with cats besides chasing them. Shasta is house and crate trained but she will need to be leashed or in a house with a tall fence since she will jump them to play with another dog. She has a loud bark that would make her a good alert or guard dog. She will bark at strangers and when she hears someone at the door or someone coming home. In Shasta’s foster home she lives with three other dogs, one cat, and three children aged 7, 13, and 15. She does well with children but her loud barking may be too much for them. She does great with her foster siblings and loves to play with other dogs. Her current home has a chain-link fence that she can use her long legs to jump over and play with the neighbor’s dog so she would either need to be leashed in the backyard or have a tall fence she cannot jump. Shasta does chase her foster family’s cat that has free roam of the house, but it is just being obnoxiously playful. She is not aggressive toward cats, but as most would be annoyed with her playfulness it would be best for her to be in a home with no cats or cats that have a way to seperate themselves like her current feline friend can. Shasta can be reserved around new people and will bark at strangers. She will need to warm up to someone before she will let them pet her, but once she knows someone she is very loving and will give as many snuggles and kisses as she possibly can. Training wise Shasta knows her commands of sit, lay down, shake, and kennel up. Her foster is sure she may know more and would likely learn new tricks easily. Shasta loves going for walks and does great on a leash. She does not let many things distract her while she is walking. When her foster family is asleep or out of the house Shasta goes into her kennel without any fuss and will sleep all night without making any noise or mess. Shasta is fed twice per day at breakfast and dinner and has not shown any signs of food aggression. She knows that outside is where she should go potty and will go right away when she gets outside. Shasta would do well in a home with a loving family that does not live in an apartment or home with shared walls due to her barking. Though she is fine with cats it would be best for her to go to a home without one or one that has a way to get away from her since she will chase it. She is very playful and loving though she can be slow to warm up to people so her adopters should be aware and accepting that fact. Shasta has long legs so she can jump small fences, so a good home for her would either have her on a leash in the backyard or have a taller fence she cannot jump. Shasta’s adoption fee is $350 and she can be found under the adopt tab in dogs available for adoption on the Secondhand Hounds website. All information about the adoption process is also under the adopt tab in how to adopt.